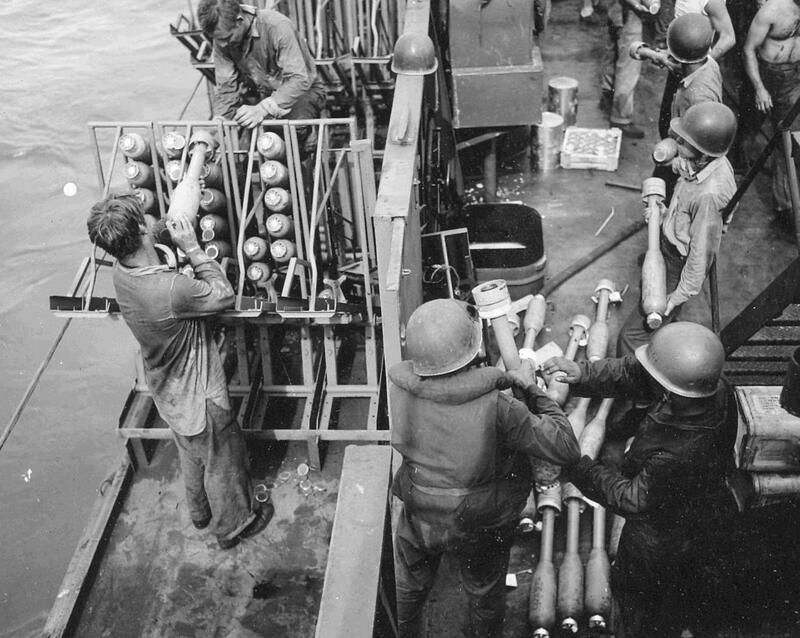 Laid down, 13 July 1943, at New Jersey Shipbuilding Corp., Barber, N.J.
NARA 257558 207k USS LCI(G)-456 crew members loading rockets during the invasion of Peleliu, September 1944. 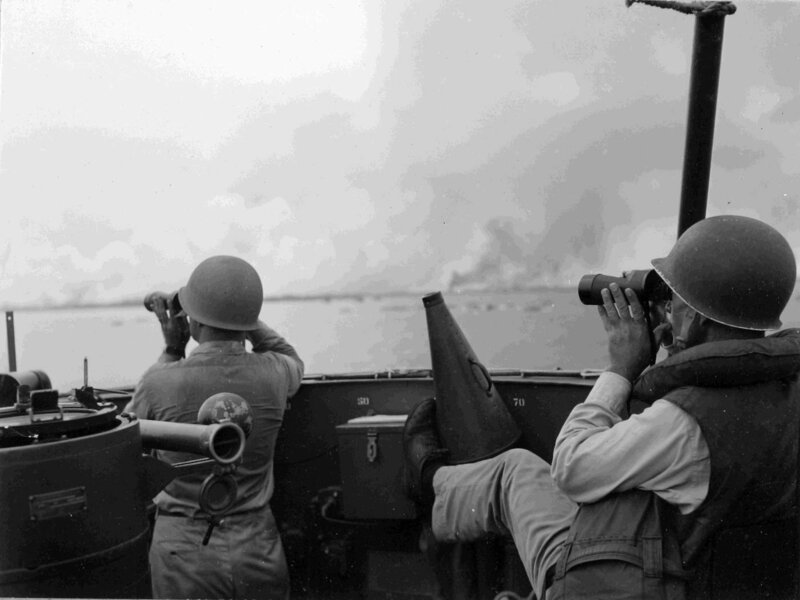 US National Archives photo #'s 257558 and 257559, US Navy photos now in the collections of the US National Archives. Jerry Gilmartin AFMM secretary LCI713 restoration crew. 137k USS LCI(G)-456 in the conn during the invasion of Peleliu in September 1944. A US Navy photo now in the collections of the US National Archives. Jerry Gilmartin AFMM secretary LCI713 restoration crew. 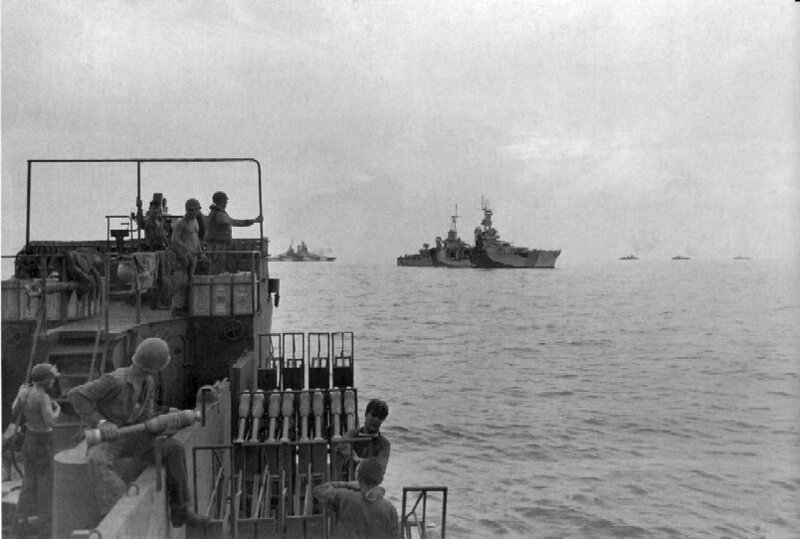 225k USS LCI(G)-456 view from the conn during the invasion of Peleliu in September 1944. 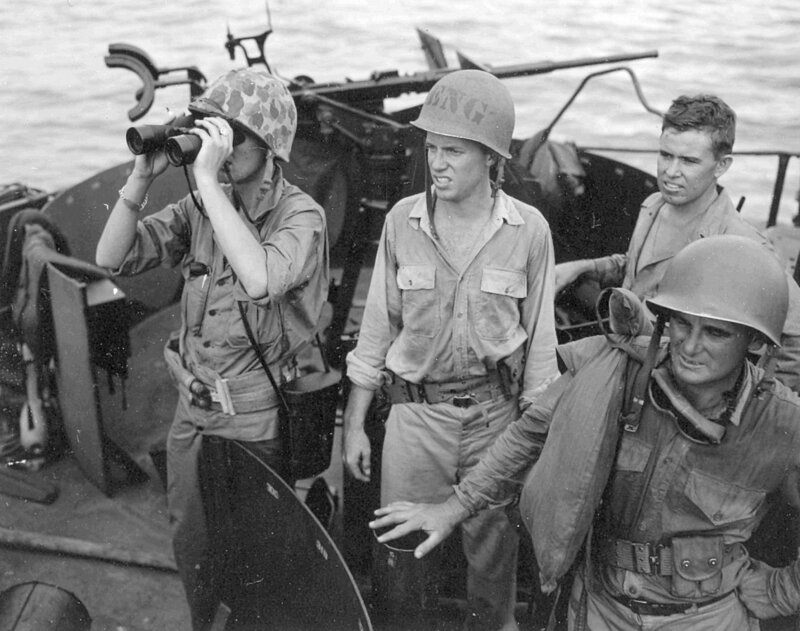 Note the US Marine liaison officer observing the battle from the ship's conn.
59k USS LCI(G)-456 at anchor. This photo of USS LCI(G)-456 was taken when she was doing picket duty, mostly at night, at Peleliu after the invasion. 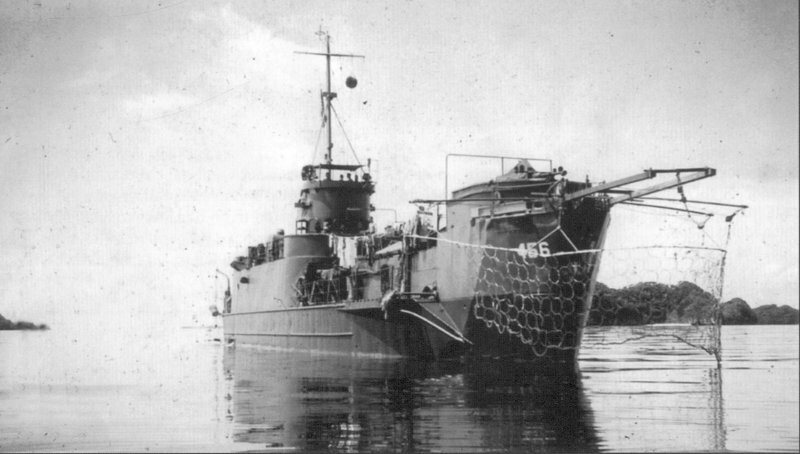 The heavy screen constructed by the crew was lowered when the ship anchored by the bow to protect them from mines that the Japanese floated down stream toward them. Luckily, the contraption was never tested, nor did the Navy Department send out their engineers to copy it. 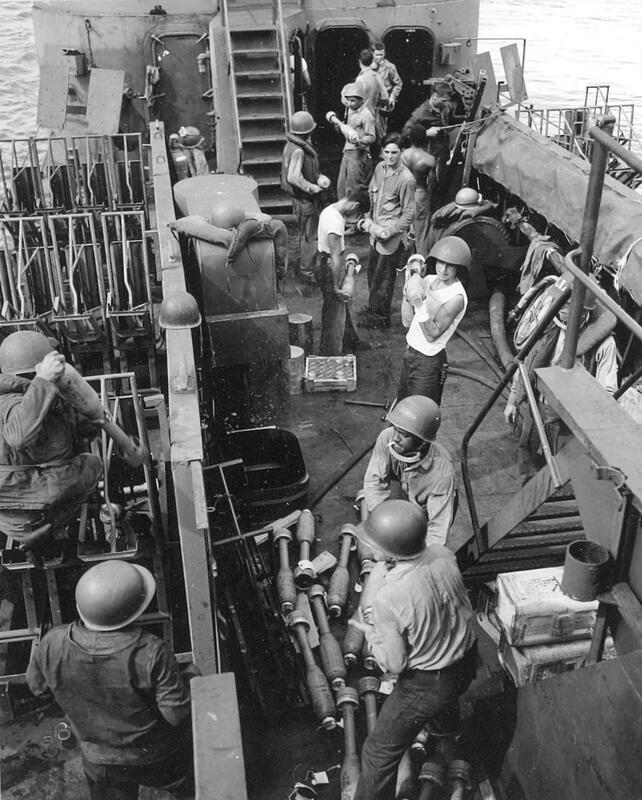 74k USS LCI(G)-456 prepares to fire 4.5" rockets from her Mk 7 launcher at Peleliu, 19 september 1944. The heavy cruiser USS Portland (CA-33) is in the background. Note the pipe guard to prevent the bow 40 mm gun from firing into the ship; it had no director system to do so.